NASA held another press briefing this week about the latest findings from the Curiosity rover on Mars, detailing new evidence that this former lake environment was once quite hospitable for possible life. The findings were announced from the fall meeting of the American Geophysical Union in San Francisco. 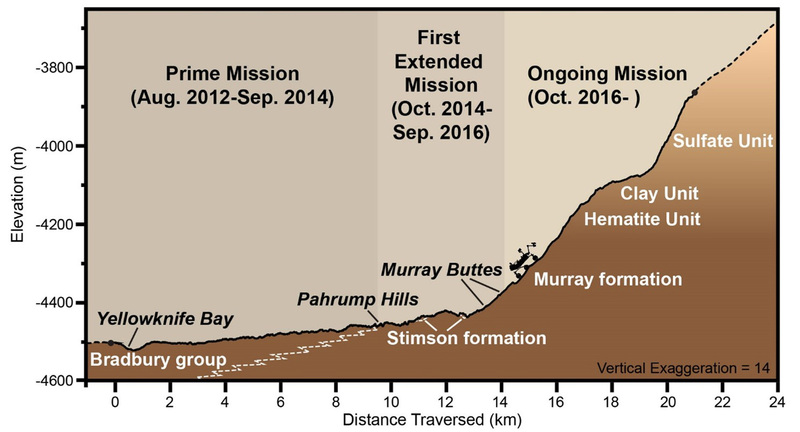 In a related development, there is also new evidence from Curiosity that organics have not only been definitively found by the rover, but that they may be more widespread on Mars than previously thought. The higher up the rover climbs, the younger the sedimentary layers are. 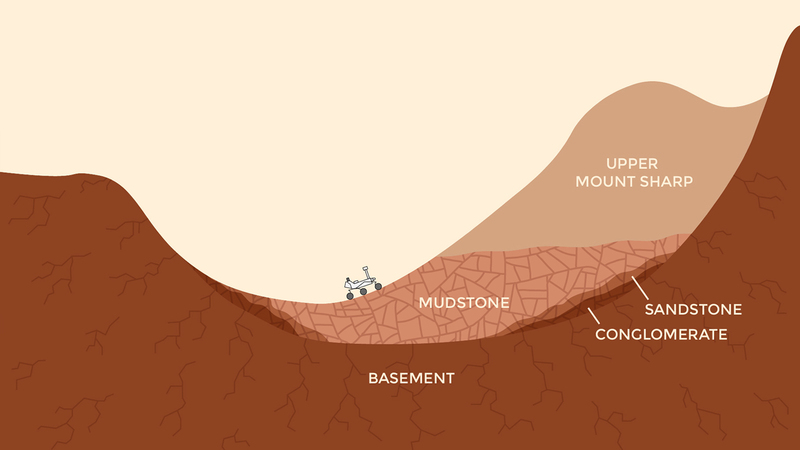 Curiosity has found evidence for not only the old lakebeds but also extensive groundwater. Such an environment, where other evidence has also suggested the water was not too salty or acidic, would have been ideal for at least microscopic life, if it ever existed. 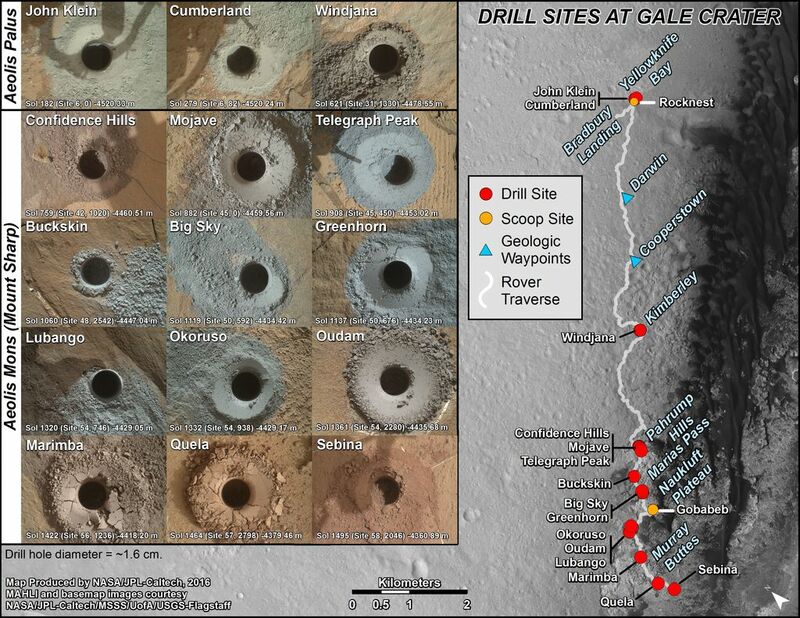 Curiosity has taken rock samples from 15 different drill sites now, each one adding another piece of the puzzle. The four most recent drilling sites, from “Oudam” last June through to “Sebina” last October, are each spaced about 25 metres (80 feet) apart in elevation. One of the key minerals that Curiosity has found is hematite. It has been found to be more common in recent samples taken than the less-oxidized magnetite, which was dominant in the older lake-bottom sediments examined earlier. 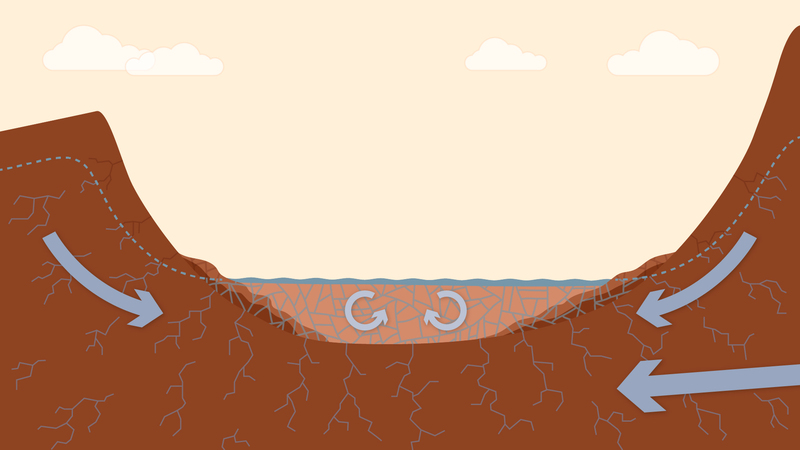 “Both samples are mudstone deposited at the bottom of a lake, but the hematite may suggest warmer conditions, or more interaction between the atmosphere and the sediments,” said Thomas Bristow of NASA Ames Research Center in Moffett Field, Calif. 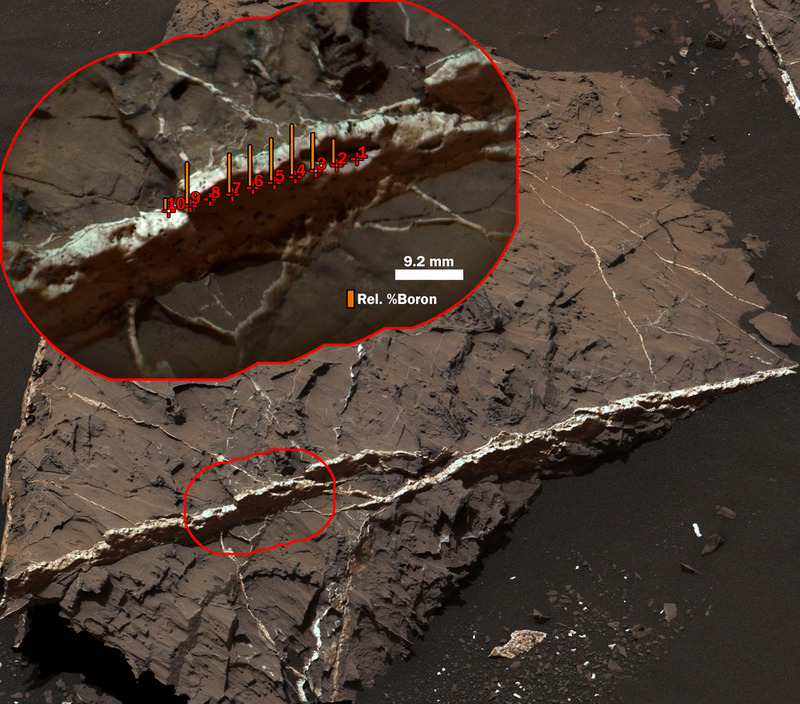 Curiosity has also found another element recently, boron, within the mineral veins seen in many of the rocks examined by the rover. This is the first time it has been detected by any Mars rover or lander. Boron is significant since, on Earth, it is common in arid regions where water has evaporated away. It is also a key building block of life on Earth. On Earth, boron is tied to the formation of ribose, a key component of RNA. 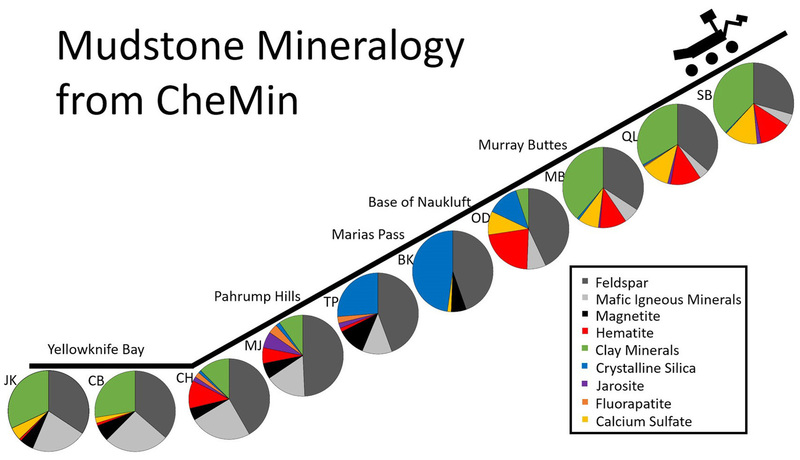 Scientists are still figuring out how the boron got into the mineral veins. Right now, there are two main theories: Evaporation of a lake formed a boron-containing deposit in an overlying layer (not yet reached by Curiosity), then the water later re-dissolved the boron and carried it down through fractures into older layers. There, it accumulated along with other fracture-filling vein minerals. The other idea is that perhaps changes in the chemistry of clay-bearing deposits, such as evidenced by the increased hematite, affected how groundwater picked up and dropped off boron within the local sediments. Eigenbrode also noted that the rocks contain more complex organic macromolecules. On Earth, about 70 to 90 percent of organic matter is macromolecular. The organics themselves do not directly answer the question of whether life ever existed on Mars, since it is not known if they are biological in origin or not, but they do provide valuable clues, especially if they are widespread on the planet. Scientists are also pondering how they have been able to survive this long in the harsh radiation on Mars’ surface, even though they were found in rocks drilled by the rover. It was also noted by Grotzinger that silica-rich rocks, which Curiosity has also found, are ideal for preserving microscopic fossils, at least on Earth. Curiosity has revolutionized our understanding of Mars; in addition to the old lakebeds and organics, it has found evidence for an ancient oxygen-rich atmosphere, visited massive sand dunes and buttes, discovered evidence for a possible “continental crust” and possible liquid water brines, and found biochemically accessible nitrogen and measured current methane in the atmosphere. It may even have already found evidence for past microbial life, although the jury is still out on that one. As to what happened with the drill, the two main theories right now are that a brake on the drill feed mechanism did not disengage fully or an electronic encoder for the mechanism’s motor did not function properly. Engineers are confident they can fix the problem, but first they must determine why the motor did not work properly. The drill feed mechanism pushes the front of the drill outward from the end of Curiosity’s robotic arm. The drill then collects samples of powdered rock that is analyzed by the laboratory instruments onboard the rover. All is not lost for the time being, however. “We still have percussion available, but we would like to be cautious and use it for targets where we really need it, and otherwise use rotary-only where that can give us a sample,” said Curiosity Project Scientist Ashwin Vasavada at JPL. Curiosity has now driven a total of 15.01 kilometres (9.33 miles) since landing in Gale crater in August 2012. It has also climbed 165 metres (541 feet) in elevation so far since landing. Additional images from the AGU presentation can be seen here, and more information about the Curiosity mission is available here.